Unless you are in the capital for a single day, you can not miss in your itinerary to visit Rome a stop in the Vatican City. We suggest that you arrive early in the morning (get off at Ottaviano-San Pietro metro stop) when the flow of visitors is still limited. 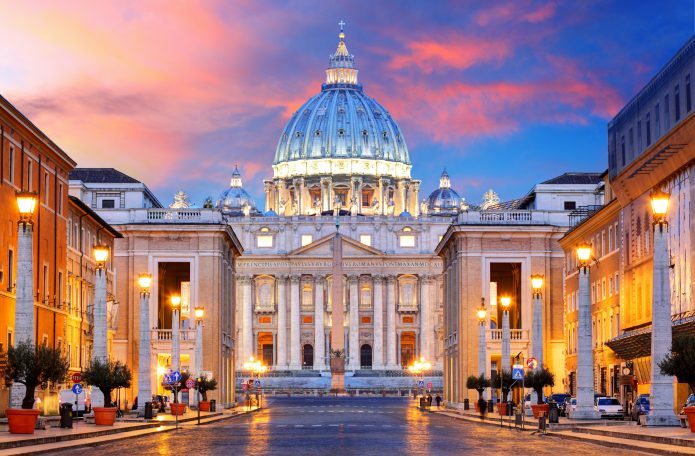 You will still have the whole day ahead of you to visit all of the attractions of St. Peter’s Basilica, the Vatican Grottos, the wonderful Vatican Museums (you should buy tickets online to skip the queue). Note: If you want to enjoy all the treasures of the Vatican and visit Rome while saving time and keeping an eye on the wallet, you can take advantage of the Omnia Vatican & Rome card which gives you also unrestricted access to public transport and allows you to enjoy several discounts. The Vatican City stretches on the right bank of the Tiber, in an area where there was no urban development. The Ager Vaticanus began to be taken into consideration only at the end of the Republican age (1st century AD) when villas and gardens were built there. Later Augusto (63bc – 14ad) completed a naval battleground (naumachia), while Nero (37 ad – 68ad) made a circus. In the circus and in the gardens of Nero, many Christians were martyred, including St. Peter (67 AD). In memory of the Apostle the construction of the two grandiose basilicas was started: the first wanted by Emperor Constantine in 324, the second wanted by Pope Julius II in the Renaissance and built on the same place as the previous one. Near the basilica, over the centuries, the Vatican City has been developed, where the head of the Catholic Church lives and that is a jealous guardian of invaluable art treasures. The state of the Vatican was born on February 11, 1929, when representatives of the Holy See and those of the Italian State signed in the Lateran Palace, a Treaty establishing the State of the Vatican City, as an independent state with precise topographical boundaries. The treaty entered into force on 7 June of the same year. Vatican City extends over an area of 0.440 sq km with a population of about 836 inhabitants. It prints its own currency, but because of the customs and monetary union with Italy it has adopted the Euro. On the eight types of coins, the epiphany of the reigning pope is printed in the national face. It prints also its own postage stamps valid for worldwide shipments, but only when delivered by the Vatican Post. The state prints its own newspaper, the Roman Observer, and has its own Vatican Radio station, inaugurated by Guglielmo Marconi in 1931. The official language is Italian, while Latin is the official language of the Holy See. Inside the Vatican City and in the extraterritorial buildings the service of police patrol and of police are performed by the police officers and by the Swiss Guard. He is head of state and at the same time bishop of Rome. He enjoys full and supreme court jurisdiction over the whole Church. He is assisted in the government of the Church by a Sacred College of Cardinals and by the Roman Curia. It is an armed body serving the papacy since January 22, 1506, when a group of 150 mercenaries swept into the Papal State to serve Pope Julius II. he must be of male, be of Catholic faith, have a Swiss citizenship and an age between 18 and 30 years. In addition, one must have served in the Swiss Army and remain celibate (marriage is only granted to those who reach the rank of senior and upper grades).